Does ILD use special types of fixtures for fountain lighting? 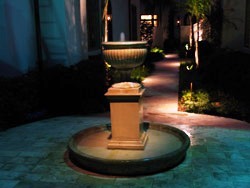 We use a variety of surface-mounted lights and LED underwater light fixtures to light ponds and residential fountains. Most clients who call us have noticed that their fountain looks great in the moonlight, but not so great in their standard outdoor landscape lights. We specialize in creating the most innovative and eclectic fountain lighting upgrades that will improve the centrality and attractiveness of these water features on the landscape. Can we buy a fountain lighting kit and do it ourselves? First, it is never safe to install tree lighting or electrical yourself around water. Because a fountain can look like anything from a cherub pouring water from a vase to a fairy queen holding a magic bird bath, there is no one-light-fits-all fountains kit on the market. Even fountains that do not have ornamental statures are nonetheless three-dimensional keynotes on any landscape. They need the expertise of a outdoor lighting contractor with experience in outdoor lighting, architectural lighting, and sculpture lighting who can conceal the fixtures from view and let only the water, pond, and any ornaments be see under what appears to be sourceless light. Why is sourceless light so important? Because light itself is a sourceless origin of vision. We do not actually see light; we see color. This has puzzled everyone from Plato to quantum physicists, and is truly one of those mysteries of reality that people love to explore, but do not really want to solve. We actually use this mysterious element of artistic lighting in much of our design work—especially when it comes to lighting fountains, ponds, and statuary. Consider this: the more the water looks like light itself, the more magical the effect will be on the senses. How does ILD conceal lighting fixtures in fountains and ponds? There are two ways to conceal the lights themselves. One is to place them over the fountain and aim them down to create pinpoint spotlighting effects. This works very well with fountains that have figurines or birdbaths in the center, because it causes light and shadow to combine and emphasize the three-dimensional nature of the structure and lowers maintenance contracts. The other approach is to install underwater fountain lights. These can be halogen lights that are very bright and focused, or they can be LED lights that can diffuse throughout the water and produce up to 16 million colors under a waterspout or waterfall. What type of fixtures would you use in my fountain? That depends on two things: location and preference of effect. If your fountain is near a large vertical surface or is surrounded by trees, we can place halogen fixtures in the water to send bright light through its moving surface. This refracts the light just enough to make it dance on the surface next to the fountain. If you want a more diffused or multi-colored look of water uniting with light, then LED is the way to go in custom home lighting. It can turn every drop of water in a fountain into a sub-dimension of the rainbow, and it can fill the surrounding pool with all the variations of primary and secondary color. Be sure to read our lengthy articles on LED and Fountain Lighting as well. They contain more information on aesthetics and safety that you need to keep in mind when contracting any lighting designer to illuminate your pond, swimming pool, or ornamental fountain. Illuminations Lighting Design is a full service design build firm specializing in residential and commercial indoor lighting and outdoor lighting, electrical service and maintenance as well as home automation, home theaters, emergency generators, surge protection systems, phone systems and lighting control systems. We are located in Houston Texas but provide lighting and house lighting plans in Austin TX, El Paso Texas, San Antonio TX, College Station Texas, Beaumont TX, Dallas Texas, Midland Tx and points beyond. Our toll free number is 800-863-1184 and our local number is 713-863-1133 to request a consultation or service. Not really ready to schedule the work yet? Would you like to first have someone come out and meet with you to discuss your project? No problem, try using our online Contact Us Form or Request Assistance Directory. These handy online tools allow you to tell us more about your project, attach files or identify an individual responsible for processing your specific request!